Ucreate Games puts mash-up creativity and game creation into the hands of kids. Using your computer screen and the Ucreate Games tablet, kids can build and customize unique games using hand drawn lines and a library of fun, interactive game elements, including: drawing templates, photos, sound effects, and recognizable game components. Ucreate Games uses a unique, photographic interface that automatically recognizes game activities and captures the user’s creations. This customizable gaming experience provides an endless variety of challenging game play that the user controls. 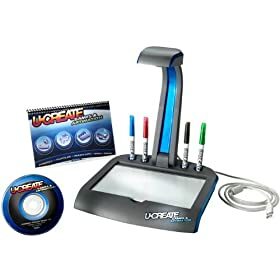 Ucreate Games includes: drawing table, folding camera, USB connection, software, dry erase drawing supplies, and game template booklet.